With modern decor and egg-shaped pedicure stations, NailBar and Beauty Lounge infuses luxury service with an upbeat and exciting ambiance. Desiree Parth originally came to Miami in 1998 after attending medical school in Brazil. She worked as a spa manager for Le Spa Lancôme before deciding that it was time to venture out and run her own salon. “The nail industry was getting big and it was time to jump in and make it something special,” she says. In March 2011, Parth bought an existing salon and revamped it, turning NailBar and Beauty Lounge into the unique, modern, and exciting salon it is today. The 1,600-square-foot salon is located in the heart of Midtown Miami, the newest up-and-coming area that’s referred to as “mini-Soho,” situated among trendy restaurants and shops. In order to keep up with the stylish clientele, at 5 p.m., disco lights and upbeat music come on for those attending happy hour in the area. Parth tries to maintain the Miami vibe and takes pride in her salon’s uniqueness. Parth features all kinds of services to match the salon’s various clientele. For little girls, there is the Mini Diva party. For couples, there are joint amenities. Extra massage requests are given to the men who treat themselves to a spa mani/pedi. Once or twice a month, a body artist comes in to do body art, and of course, the salon provides traditional nail and beauty treatments. Parth likes to give her customers a range of services to choose from. NailBar and Beauty Lounge does see quite a few Miami celebrities as well. Often, Miami Heat players and their wives or some of the women on “The Real Housewives of Miami” will visit the salon. Parth says they love coming to the salon because they are treated with a level of discretion and respect they might not get at other salons. With a colorful and modern loft-style space, where the offered amenities are painted on the wall, the salon is wide open with a cheerful ambiance. There are five pedicure stations and 10 manicure stations, a beauty bar for lashes and brows, and a treatment room for facials and waxing. The salon even offers reflexology and hot stone massages that can be added to customers’ pedicures. 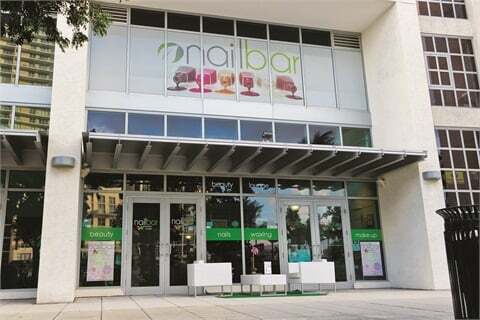 NailBar and Beauty Lounge offers every type of nail service, including enhancements, but its most popular services are spa pedicures and nail art. A spa manicure and pedicure combination (with complimentary champagne) is $55 while the early bird special of the same service is $45. The regular manicure and pedicure combination is $39.90. Parth explains that her salon doesn’t see much competition. She offers reasonable prices for high-quality and unique services and has therefore carved out a niche for herself. 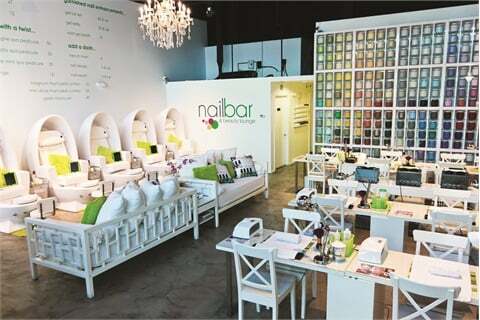 There are many salons in Miami, she says, but no one who does exactly what NailBar does. 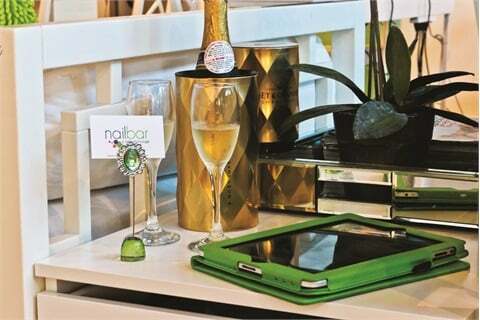 NailBar and Beauty Lounge offers clients upscale egg-shaped pedicure stations, each equipped with LED lights and an iPad. The spa pedicure tubs use disposable liners, and the hour-long service is available with the option of various scented sugar scrubs and a foot massage. Parth makes sure to use the best products for her customers while being environmentally conscious. The raw sugar scrub is all natural, the herbal lotion is organic, and the salon puts an emphasis on recycling. Parth began posting the salon’s high-end nail art on social media as a way to market her business and since then she has noticed other salons around Miami have adopted the trend. It began as a free way to attract positive attention to the salon and gain more clientele. Now, her technicians passionately approach her with new ideas and concepts. With her employees, Parth encourages a high level of consistency and professionalism. Each new technician is trained for three to four weeks. They learn everything from how best to close a conversation with a customer, to the correct approach for a foot massage. Parth likes to ensure her salon provides the best service so the technicians are trained in every detail. This way the customer will have the same experience no matter who she sees. Nail techs are paid a commission per service while Parth provides all the products. She encourages staff to attend trade shows and stay current on nail trends. Parth also likes to attend trade shows and read about the latest information for the industry. Though managing personnel can be challenging, Parth makes sure to address any issues during staff meetings in order to keep her employees happy. One perk the staff at NailBar and Beauty Lounge receives is a certain amount of free or discounted services per month. The fact her employees have been with her for so long is evidence of their job satisfaction.